When the Seahawks needed one more score, or one more stop, they couldn't get it. Seattle pushed the undefeated Rams to the final possession, but it couldn't pull this one out. When the Seahawks needed one more score, or one more stop, they couldn’t get it. 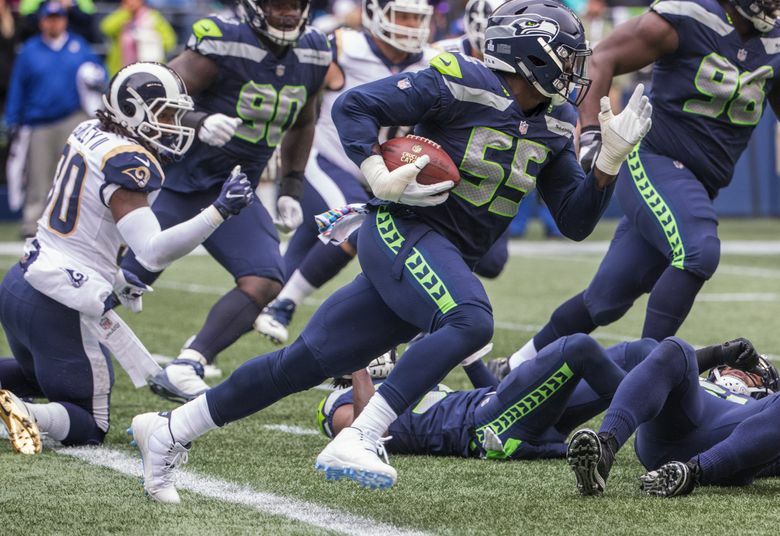 Here are three impressions from the Seahawks’ 33-31 loss to the Los Angeles Rams. Heading into the season, Pete Carroll and Brian Schottenheimer painted a picture of an offense that establishes the run, batters opposing defenses and sets up shots with play-action. That vision finally came to fruition (for three quarters) on Sunday. For the third consecutive week, Seattle produced a 100-yard rusher, as Chris Carson carried 19 times for 116 bruising yards and added an 11-yard reception. Mike Davis, the star of last weekend’s win over Arizona, also added 12 carries for 68 yards and a touchdown. Quarterback Russell Wilson also had a productive afternoon, completing 13 of 21 passes for 198 yards and three touchdowns. Two of those touchdown heaves went to second-year wide receiver David Moore, who also registered the first two touchdowns of his NFL career. Wide receiver Tyler Lockett claimed a 44-yard catch in the fourth quarter as well as a 39-yard score. When the Seahawks needed a fourth-quarter score, however, they couldn’t find one. A false start penalty on Germain Ifedi and a holding penalty on D.J. Fluker drove Seattle out of field goal range with a two-point deficit late in the fourth quarter. The Seahawks wouldn’t get the ball again. The Seahawks’ special teams provided a little bit of everything on Sunday, both positive and negative. Rookie punter Michael Dickson had a punt blocked in the first quarter. Sebastian Janikowski’s first two kickoffs landed short of the goal line and were returned for a total of 75 yards, forcing him to be benched in favor of Dickson’s drop kicks for the remainder of the game. On the other hand, Janikowski also drilled a 52-yard field goal in the first half and wide receiver Tyler Lockett returned a punt 42 yards. Los Angeles’ special teams units were equally erratic, however. Most notably, new Rams kicker Cairo Santos shanked an extra point in the fourth quarter that would have tied the score at 31-31. Clark did play, and it didn’t take him long to make an impact. The fourth-year Seahawk effectively ended the Rams’ first offensive drive by stripping quarterback Jared Goff on a speed rush, and he forced the same result on the following drive by snagging an interception in the end zone. Clark returned the interception — the first of his NFL career — 26 yards, shaking off tackles and zigging and zagging around blocks. Following Clark’s interception, however, the Rams scored 17 points on their next three drives. They also scored 17 points in their three drives in the second half. And when they needed a pair of first downs to run down the clock and end the game, the Rams got that, too, with the exclamation point being a Jared Goff quarterback sneak on fourth-and-1.